here is David Cameron’s begging letter hoping for a fudge to try to dupe the peoples of Britain into remaining as a vassal region of the undemocratic EU. May I suggest David Cameron & his chums who seek to surrender Britain’s democracy accept his claims are inadequate and require a Leave-The-EU vote, if for no other reason than whatever the EU accepts it will reconsider and offer a better deal for a second vote – The EU NEVER accepts a vote it doesn’t want as they neither practice nor believe in democracy they have an almost 100% track record of forcing second votes to give bigger bribes to get what THEY want at the expense of the democratic electorate. David Cameron has four key themes of re-negotiation strategy; including economic governance, competitiveness, sovereignty and immigration; which he sets out in the full 2,000 word text of his letter to Donald Tusk the unelected EU Council President. If David Cameron’s letter was a statement of Britain’s red line demands some might claim it was adequate, however it does rather seem that the only supporters of Britain’s membership of the EU in Britain are those receiving direct bribes, by way of income, grants & pensions. Third, I want to see the EU’s commitments to subsidiarity fully implemented, with clear proposals to achieve that. As the Dutch have said, the ambition should be “Europe where necessary, national where possible”. In addition, the UK will need confirmation that the EU institutions will fully respect the purpose behind the JHA Protocols in any future proposals dealing with Justice and Home Affairs matters, in particular to preserve the UK’s ability to choose to participate. National Security is — and must remain — the sole responsibility of Member States, while recognising the benefits of working together on issues that affect the security of us all. The UK believes in an open economy. But we have got to be able to cope with all the pressures that free movement can bring — on our schools, our hospitals and our public services. Right now, the pressures are too great. The issue is one of scale and speed. Unlike some other Member States, Britain’s population is already expanding. Our population is set to reach over 70 million in the next decades and we are forecast to become the most populous country in the EU by 2050. At the same time, our net migration is running at over 300,000 a year. That is not sustainable. We have taken lots of steps to control immigration from outside the EU. But we need to be able to exert greater control on arrivals from inside the EU too. Britain has always been an open, trading nation, and we do not want to change that. But we do want to find arrangements to allow a Member State like the UK to restore a sense of fairness to our immigration system and to reduce the current very high level of population flows from within the EU into the UK. These have been unplanned and are much higher than forecast — far higher than anything the EU’s founding fathers ever envisaged. These very substantial flows of population have, of course, also had a significant impact on a number of Member states, many of whose most highly qualified citizens have departed en masse. So this is a shared challenge. The United Kingdom is the EU’s second largest economy, the fifth biggest in the world. We bring an enormous contribution — political, economic, financial — to the European Union. If we are able to reach an agreement, it will show the world that, amongst the many more difficult issues it faces, the European Union is flexible enough to accommodate the concerns of its members. I hope and believe that together we can reach agreement on each of these four areas. If we can, I am ready to campaign with all my heart and soul to keep Britain inside a reformed European Union that continues to enhance the prosperity and security of all its Member States. 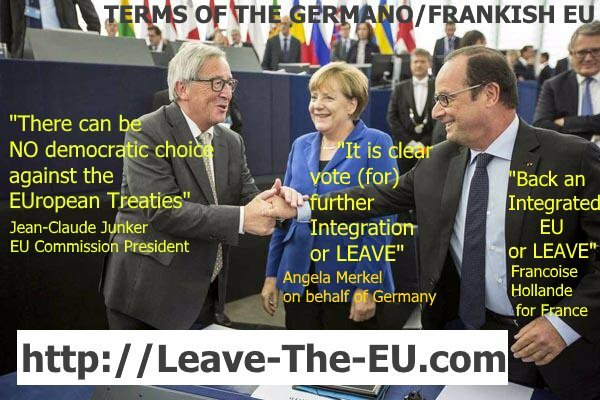 @eucopresident Had it occurred to you that ‘#UKinEU negotiations’ might be an indication of YOUR values Not #Britain‘s? Try #UKOUTorINEU! Next Next post: David Cameron’s Abandoned EU Commitments – 15 So Far!